Some startups jump into public view with a big splash. Others simply get in and start quietly swimming. This is the case for Las Vegas-based ADDiTEC, which introduced a comparatively low-cost desktop metal 3D printing system to no fanfare just six weeks ago. 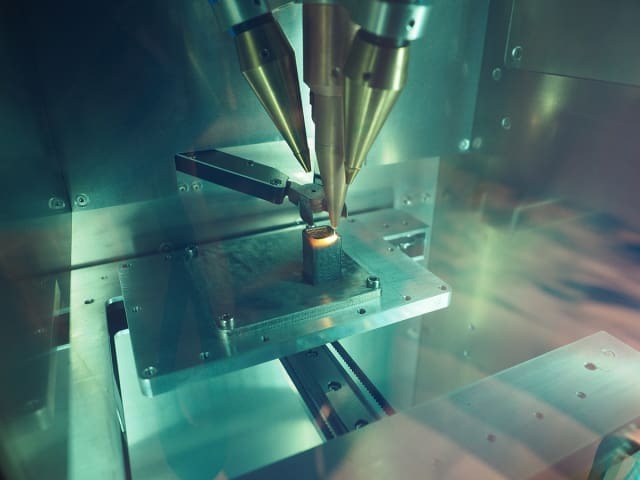 Unlike other firms that have garnered significant media attention and investment, but have been slow to ship actual products, ADDiTEC is entirely self-funded and is already delivering its directed energy deposition (DED) 3D printer to customers. Moreover, the technology is capable of printing both metal wire and metal powder, separately or in a hybrid fashion, which is, as far as we are aware, previously unseen in the industry. To learn more about ADDiTEC and its technology, we spoke to the company’s CEO and founder, Brian Matthews. Before we jump into the backstory of the company, you may want to know a bit more about the desktop DED technology that ADDiTEC is manufacturing. Dubbed the μPrinter (read aloud as “micro printer”), the system is a $90,000 machine capable of 3D printing both metal wire and powder. While the overall size is compact (390mm x390mm x 1100mm), its build envelope is actually pretty substantial at 160mm x 120mm x 450mm. It features three 200W diode lasers for a total of 600W of power (two more lasers are available as an upgrade for 1kW of power). Printing takes place within an argon chamber that only requires a small amount of gas, according to the company. The system features “active process control,” which automatically sets the nozzle to part distance for each layer and also manages process parameters throughout the print based on sensor feedback. A built-in wire cutter can be used during print failure, with the controller automatically returning to the point where the issue occurred, cutting the metal wire and continuing the print process. One of the potentially larger users of a desktop DED system, such as the μPrinter, is researchers in universities or labs. Matthews estimates that roughly two-thirds of inquiries for the system have come from universities from all over the world. 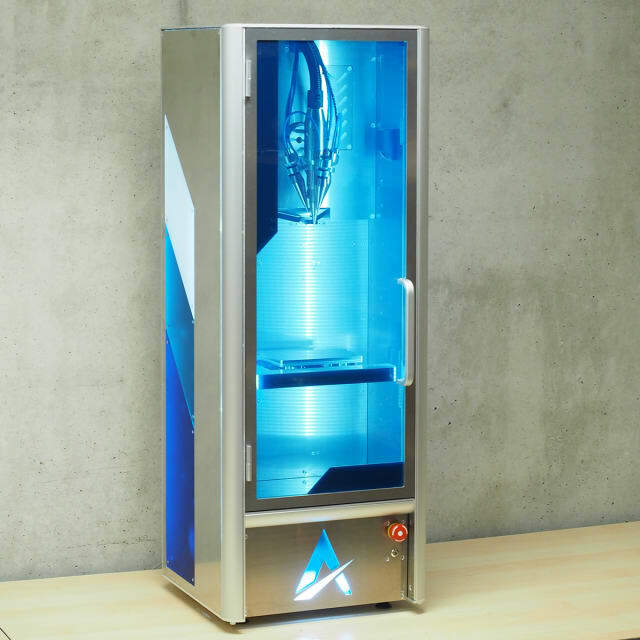 The μPrinter makes sense for experimental applications, both as an entry into larger DED systems and as a means of performing material development and hybrid metal 3D printing. Before embarking on a large-scale DED machine, the desktop printer can be used to determine if the technology is even right for a given application. 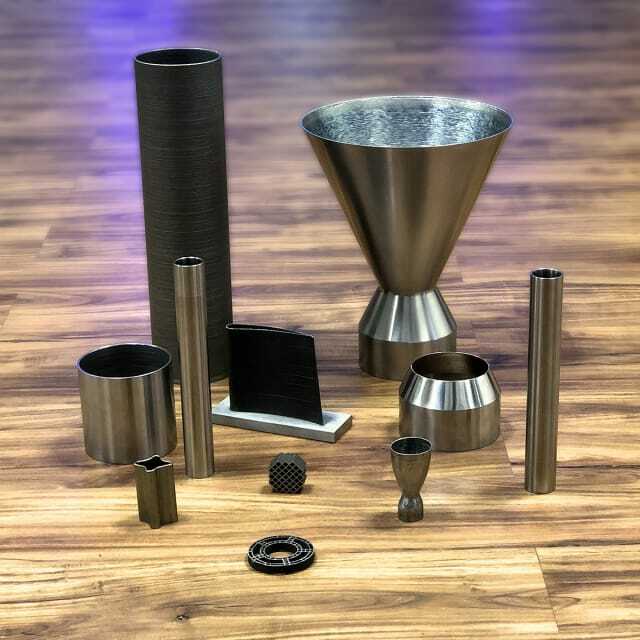 The ability to combine materials, using wire feedstock for one metal and powder for another opens up a world of possibilities for material experimentation. Matthews used the nuclear and aerospace industries as examples of where such hybrid parts might be of interest. As for the aerospace industry, metals with good structural properties could be coated with those with good thermal properties. Prior to founding ADDiTEC, Matthews had worked in nuclear engineering for the past 20 years. The nuclear industry is one of large, complex and unique structures. It’s also one of extremely high costs. Matthews sought to make the manufacturing of such large structures more affordable and saw AM as a tool that could make doing so possible. After immersing himself in the technology for about two years, understanding the state of metal AM and learning where the problems lay, he realized that there was “a world of opportunity,” particularly with DED. This led to the formation of ADDiTEC, which embarked on a two-phase journey. The first phase involved the design and construction of a large metal 3D printer, 1.5m in diameter and 2.5m tall. The second phase was aimed at “reinventing” metal deposition, with the goal of reducing cost and printing wire and powder in the same nozzle. Many of the large systems rely on powder, which Matthews pointed out can be inefficient in terms of cost and material waste. Metal powder is more expensive than wire and machines that print with powder can only use a portion of the powder. The end result was what ADDiTEC calls the Deposition Module, a $90,000-module capable of transforming any CNC machine into a DED or hybrid system. The product includes the deposition head, made up of three 200W lasers for a total of 600W of power, and everything else one would need to begin 3D printing with metal wire (powder is not recommended for retrofitted CNC machines). The module was launched last year and Matthews claims that, with no advertising other than a single press release and attendance at one trade show, ADDiTEC has already sold 10 modules. “We quickly realized that what we were selling was the engine and what the vast majority of customers seemed to be requesting or desiring was the entire vehicle,” Matthews said. This led to the development of the μPrinter. Now that ADDiTEC is selling “the vehicle” and “the engine,” the company plans to begin selling larger printers as well. The next system will be called the mPrinter and will have a build envelope in the range of 750mm x 750mm x 1000mm. That machine will be followed up by the kPrinter, which will have a build volume in the range of 2m x 2m x 3m. 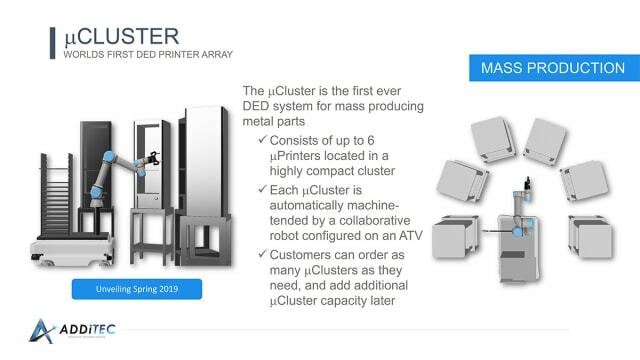 The company is also exploring the possibility of developing what Matthews called the μCluster, made up of six μPrinters that would be serviced by a robot that would remove prints, replace build platforms, and initiate new prints automatically. “If you’re a company interested in producing small parts in a volume manner and if you have say three microclusters, now you’ve got almost 20 printers working autonomously,” Matthews said. There are variations of this concept being explored by a number of companies, including Voodoo Manufacturing, 3D Systems, Markforged and Formlabs. The first two in the list actually employ the use of robotic arms, while the second two have only introduced arrays of machines working together. 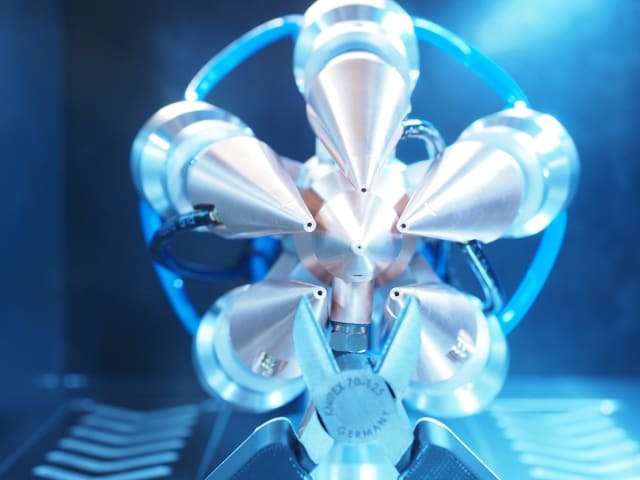 GE Additive subsidiary Concept Laser also envisions the use of automation and robotics for its AM Factory of Tomorrow, but has yet to realize its dream. ADDiTEC’s concept, however, would have a number of unique features going for it. To start, no company has yet developed a machine capable of wire and powder DED 3D printing. As far as we are aware, no one has yet shrunk DED size and costs to this size. And we have yet to see both of those achievements realized in a cluster manufacturing format. The firm has yet to decide if it will go down that route, but plans to unveil the μCluster this spring. To learn more about ADDiTEC, visit the company’s website.